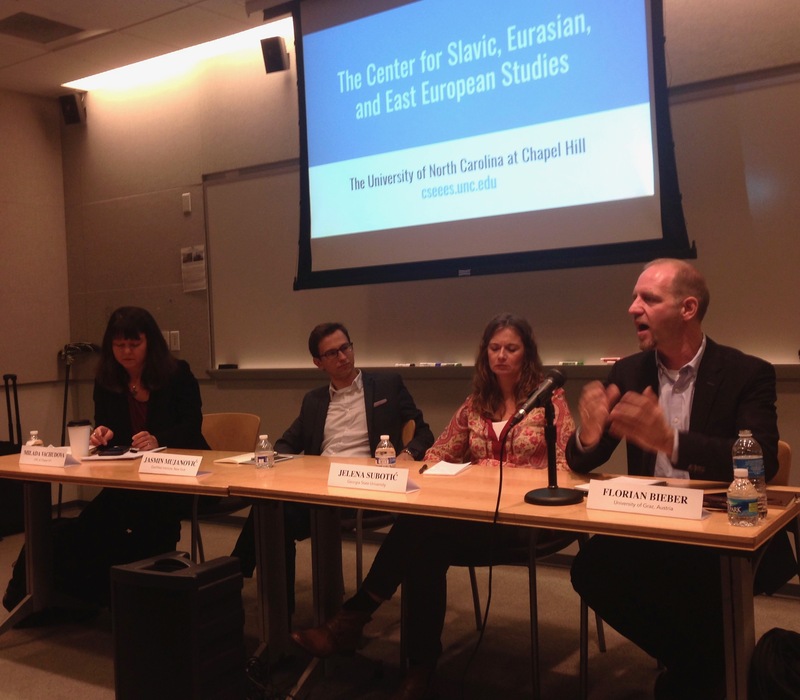 On November 13, the newly inaugurated UNC Forum on Southeast Europe hosted a panel discussion exploring democratic backsliding in the Western Balkans. While democracy made strides forward in the 2000s, with the end of the Yugoslav wars, the downfall of Slobodan Milošević in Serbia and the take-off of European Union (EU) integration, the current decade has seen authoritarian patterns re-emerging across the region. Pervasive corruption and state capture along with the resurgence of nationalist populism and the weakening pull of the EU have all contributed to the negative trend, captured by authoritative international watchdogs such as Freedom House, the Bertelsmann Foundation, and Reporters without Borders. Moderated by Dr. Dimitar Bechev (CSEEES Fellow), the panel brought together leading academic experts on the Balkans to delve deeper into the causes, underlying dynamics and effects of de-democratization. At the outset of the discussion, Prof. Florian Bieber (University of Graz) drew a distinction between the “old” authoritarian regimes of the 1990s, the time of Milošević and the Croatian President Franjo Tuđman, and today’s strongmen such as President Aleksandar Vučić of Serbia, Nikola Gruevski, Macedonia’s president between 2006-16, and Milorad Dodik, leader of the Republika Srpska in Bosnia and Herzegovina (BiH). Unlike their predecessors, the new authoritarian-minded politicians often embrace integration with the West and paint themselves as purveyors of stability at a time of multiple crises (e.g. the influx of asylum seekers from Syria, Iraq, Afghanistan etc. in 2015-6). However, Bieber contended, there is no single regional pattern and countries follow different paths. He emphasized the role of informal rules and levers of influence, as opposed to formal legislative changes (the hallmark of authoritarian resurgence in Central Europe), and the use of the public sector as a tool to consolidate power. Meanwhile, Dr. Jelena Subotić (Georgia State University) highlighted the rise of nationalist discourse in the politics and societies of Serbia and Croatia. She questioned the idea of discontinuity between the 1990s and the present, and pointed at the use of hate speech and the manipulation of historical memory by elites as a deeply worrying trend. Giving the audience a foretaste of his forthcoming book Hunger and Fury: The Crisis of Democracy in the Balkans (Hurst/OUP, 2018), Dr. Jasmin Mujanović (EastWest Institute) identified the current trend towards democratic backsliding in former Yugoslavia as deeply rooted in history. State capture and clientelism, obstructing the consolidation of the rule of law and accountability, stems from institutional legacies of personalized rule and societal fragmentation. Mujanović also underscored the role of international actors in obstructing democratization in the Balkans, focusing in particular on Russia, Turkey, and China. The panel concluded with a presentation by Prof. Milada Vachudová (UNC-CH), who looked at the development of parties in the Western Balkans. Drawing on data from the Chapel Hill Expert Survey (CHES) on political parties’ positioning on European integration, she argued that in Serbia and Croatia parties have moved towards more EU-compatible positions, much like in Central Europe prior to membership and in line with what theory predicts. By contrast, the Union’s leverage has not moderated parties in Macedonia and BiH, further away on the membership path than Serbia, where political systems remain highly polarized on issues of culture and identity. The presentations were followed by a lively and engaging discussion, with lots of questions and comments coming from a large audience of students, academics, and community members. Everyone agreed that the Forum’s first academic event was a shining success. There will be more to come in 2018 – stay tuned. The Forum on Southeast Europe is supported by the UNC Center for Global Initiatives and the Center for Slavic, Eurasian, and East European Studies (CSEEES).